Already available to pre-order in many markets around the world, the Galaxy S7 and Galaxy S7 edge are Samsung's latest and greatest high-end Android smartphones, succeeding last year's Galaxy S6 series, and coming with a significant number of important new features and enhancements, in addition to an upgraded (yet not too dissimilar) design. Last week, while announcing the two handsets, DJ Koh, President of Samsung's Mobile Communications Business, presented the S7 and S7 edge as the "most beautiful smartphones on the planet." Needless to say, it's not unusual, nor unexpected for companies to tout their products as the best and the most attractive on the market. But we were curious to know what our readers thought about DJ Koh's statement, so we published a poll to ask: are the new Samsung Galaxy handsets the most beautiful out there? The final poll results are now in, and we can see that almost half of those who voted (49.2%) agreed with the statement, believing that the S7 and S7 edge are, indeed, the most beautiful smartphones on Earth. On the other hand, 50.8% of voters don't think that the new Galaxies are that beautiful. Are you surprised by these results? Intrigued? Couldn't care less? If you didn't get the chance to vote in our poll while it was active, you can share your thoughts on the Galaxy S7 series in the comments section. Also, watch Samsung's Galaxy S7 event in the video below (skip to 33:02 for DJ Koh's statement), and make sure to check out our Galaxy S7 hands on, and our Galaxy S7 edge hands-on. Are the Galaxy S7 and S7 edge the "most beautiful smartphones on the planet"? If you saw either of these in person you'd quickly change your mind. It's a next level of beautiful. Looks and probably feels like a bar of soap. Doesn't look beautiful at all. Fanboism aside, do you really think so? There's no fanboyism in my comment, but I do think so. Actually, they look amazing. Most beautiful? Maybe not. Much better than phones with caulk lines. No, this time you are wrong. It looks like a screen wrapped with a beer can. It would be the Z5. This, not sure what they expected from the results. Sounds like we have an ignorant Samsung hater here. Typical Samsung hater. Can't accept 'losses', takes things personal, can't accept the truth lol. Pathetic. It's just a company mate.. .that makes a superb phone. Get a life. Seriously. I don't mind it if they like their little crap caulk line iphones. But don't say it's better cause it's snot. Already tested it in actual this morning, both devie are great looking. s7 feels like the s6 less sharp edges. Funny because when I held s7 edge I thought I was holding a compact 4.6 inch product until I realize the height in my pocket. Silver is the best color for me, gonna get one after full reviews have been made. Thanks for the confirmation about the lack of IR Blaster.. 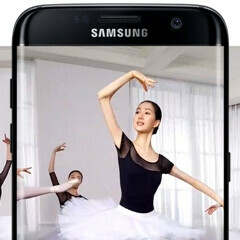 Even iPhone users in their blogs are saying the S7 is the most beautiful phone. What looks better? You can't name one because there isn't one.